Building cryptographic primitives that are secure against related-key attacks (RKAs) is a well-studied problem by practitioners and theoreticians alike. Practical implementations of block ciphers take into account RKA security to mitigate fault injection attacks. 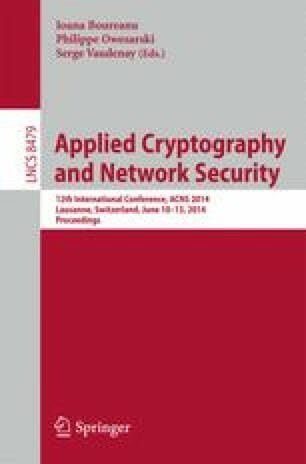 The theoretical study of RKA security was initiated by Bellare and Kohno (Eurocrypt ’03). In Crypto 2010, Bellare and Cash introduce a framework for building RKA-secure pseudorandom functions (PRFs) and use this framework to construct RKA-secure PRFs based on the decision linear and DDH assumptions. We build RKA-secure PRFs by working with the Bellare-Cash framework and the LWE- and DLIN-based PRFs recently constructed by Boneh, Lewi, Montgomery, and Raghunathan (Crypto ’13). As a result, we achieve the first RKA-secure PRFs from lattices. In addition, we note that our DLIN-based PRF (based on multilinear maps) is the first RKA-secure PRF for affine classes under the DLIN assumption, and the first RKA-secure PRF against a large class of polynomial functions under a natural generalization of the DLIN assumption. Previously, RKA security for higher-level primitives (such as signatures and IBEs) were studied in Bellare, Paterson, and Thomson (Asiacrypt ’12) for affine and polynomial classes, but the question of RKA-secure PRFs for such classes remained open. Although our RKA-secure LWE-based PRF only applies to a restricted linear class, we show that by weakening the notion of RKA security, we can handle a significantly larger class of affine functions. Finally, the results of Bellare, Cash, and Miller (Asiacrypt ’11) show that all of our RKA-secure PRFs can be used as building blocks for a wide variety of public-key primitives.